What begins as seemingly an old-fashioned war film set during the waning years of the Ottoman Empire quickly turns into a dark exploration of the Armenian genocide. This litany of atrocities, unknown to many today and denied by the Turkish government, was in many ways a precursor to Hitler’s “Final Solution”. (In a 1939 speech, he is on record as saying: “Who, after all, speaks today of the annihilation of the Armenians?”) However, despite as many as 1.5 million deaths, it remains an historical footnote to many living today with no personal connection to the events. 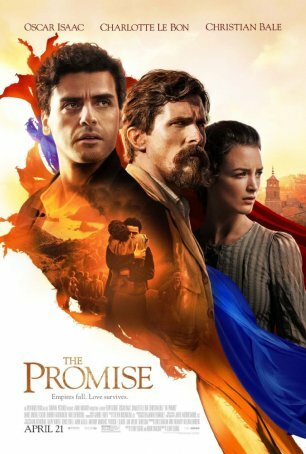 The Promise is the first major motion picture (with a respected director and “name” stars) to attack this issue head-on, unapologetically and without equivocation. Although at times overwrought and overtly manipulative, the film as a whole is like a kick to the gut. Its depictions of brutality, unusually strong for a PG-13 production, are sufficiently graphic to bring home the tragedy of the situation on a visceral level (in a way, for example, that The Zookeeper’s Wife was unable to do with the Holocaust). For director Terry George, venturing into thematically poignant and controversial territory is in keeping with his history. In the 1990s, he collaborated with Jim Sheridan on three powerful films about Ireland’s The Troubles: In the Name of the Father, Some Mother’s Son, and The Boxer. In 2004, he wrote and directed Hotel Rwanda. George understands how to convey the pain and anguish of mass tragedies and, although The Promise isn’t as tightly written and incisive as his previous work, its strengths outweigh its weaknesses. Recognizing that historical films, especially those involving the horrors of mass exterminations, work best when presented through the eyes of a small group of intrinsically noble characters, The Promise focuses on a love triangle. Would-be doctor Mikael Boghosian (Oscar Isaac) leaves his small village to become a medical student in Constantinople. He is there when the Ottoman Empire enters World War I and the reprisals against the Armenian population of Turkey intensify. While in Constantinople, he meets and falls in love with Ana (Charlotte Le Bon), a French-educated Armenian woman romantically linked with famed American journalist Chris Myers (Christian Bale), who is investigating dark rumors about death marches. Mikael and Ana’s love affair is pushed into the background when he is arrested and sent to a labor camp and she and Chris seek to provide succor for the victims. The couple’s reunion occurs in dire circumstances on the eve of a black day. When it comes to war love stories, The Promise isn’t going to challenge Casablanca. The movie is stronger when presenting the political situation than the romantic one. The chemistry between Oscar Isaac and Charlotte Le Bon is fitful and there’s even less of a spark between Le Bon and Christian Bale. For his part, Bale appears to be in the production more to lend his name to the proceedings than because the role is a good fit. Although Bale is the biggest star in the film, there are a number of notable cameos, including James Cromwell (as U.S. Ambassador Henry Morgenthau), Jean Reno, Tom Hollander, and Rade Serbedzija. The chronicle of events as presented in The Promise has been deemed accurate by a number of international historians. George and his credited co-writer, Robin Swicord, based elements of the story on Franz Werfel’s 1933 novel, The Forty Days of Musa Dagh. Various segments related to the rounding up of Armenians in Constantinople, the labor camps, the death marches and mass killings, and the battle on Musa Dagh, are representative of the historical record even though the characters and their story is fictional. George successfully crafts an authentic background for the love triangle. When The Promise stumbles, it’s because the romantic elements don’t gel. The Promise boasts impeccable production values. Location shooting enhances the film’s look. Gabriel Yared’s orchestral score channels John Barry especially during the early scenes. Like any movie about genocides and mass exterminations, this is a grim and sometimes difficult story to absorb. If the villains and heroes are too broadly drawn, the point is conveyed about the barbarism and inhumanity of the acts. Sadly, The Promise represents not only a recreation of something that happened a century ago but a cautionary tale for today. As George Santayana wrote in 1905, “Those who cannot remember the past are condemned to repeat it,” and we as a race recurrently prove the truth of those words.